Sta-Rite SuperMax VS swimming pool pump bring the remarkable energy cost savings of variable speed technology to standard pools at an affordable price. They slash energy costs by up to 80% while helping to keep your pool sparkling clean and inviting. Sta-Rite SuperMax VS pump come to you from the trusted leader that launched variable speed technology to the swimming pool industry years ahead of every other pump manufacturer. No wonder we still outsell all other variable speed pumps. The Sta-Rite SuperMax VS pump is easy to install. Its advanced digital display also makes it easy to use, and unlike others, you don’t have to buy and install a separate timer. Only variable speed pump on the market today with 110/230 volt capability. The Sta-Rite SuperMax VS pump costs significantly less to operate because its variable speed technology moves water more efficiently at lower speeds. deal for standard pools requiring up to 1.5 hp pump. Affordable for new and standard pool pump replacement applications. 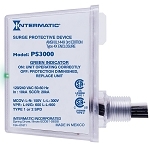 Simple, intuitive user interface displays watts, RPM, current time and remaining program duration. Direct...and superior drop-in replacement for the Hayward Super Pump. For pool owners who want to step-up to the energy savings of variable speed technology, the Sta-Rite SuperMax VS pump is the wise choice. It will save up to 80% on operating energy costs versus standard single-speed pumps. And the Sta-Rite SuperMax VS pump is engineered for easy installation, simple operation, and trouble-free service. Wiring is easy and unlike other pumps, the electronic board is not exposed to exterior elements at installation. 10/230 volts, 50/60 Hz single phase. I can't believe how quiet this pump is! This pump matched up perfectly with my Pentair EasyTouch PL4 and Pentair MasterTemp 300k BTU heater I also purchased from PoolCleaningParts. All were replacements for decades old equipment that failed, and my spa guy easily replaced and hooked up for me. I can't believe how quiet this pump is! We run it in our spa for several hours a day using about as much electricity as a light bulb, and when we use the spa, it gets a little louder, but still very quiet and powerful. It's similar to the Pentair pumps, but this one has a little easier access to the impeller, and motor (though Pentair owns both companies.) I think it's more of a pro model, so that helped make the decision for me. We've had absolutely no problems with it - flawless! Oh, and amazing service, (extremely) quick shipping, and very competitive pricing from PoolCleaningParts - that's why I went back to them twice more! 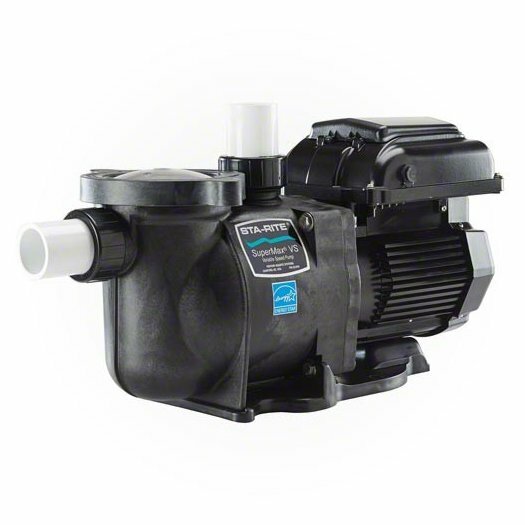 Q: what is the warranty on this sta-rite SuperMax VS variable pool pump? Sta-Rite SuperMax VS local power company rebates. Sta-Rite SuperMax VS Energy Savings Calculator.